Smile creations - working towards comfortable dentistry! 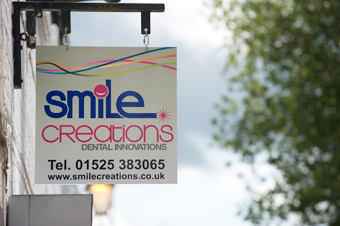 Established over 25 years ago, Smile Creations Dental Innovations® is an Award winning Dental and Specialist Orthodontic Practice based in the center of Leighton Buzzard, just 40 minutes north of London. We are a boutique family run business lead by principles Dr. Arun Darbar (Laser & Aesthetic Dentist) and Dr. Rita Darbar (Specialist Orthodontist) and are always willing to go that extra mile for your needs. Our practice motto is “Working towards Pain Free Dentistry!” We believe in minimally invasive and preventive dentistry and hope to promote more long term and permanent procedures, hence establishing a low maintenance programme. Unleash your better athlete. ArmourBite® style. The ArmourBite® Mouthpiece (featuring our patented Power Wedges™) fits snuggly – and stealthily – on your bottom teeth. In doing so, it unlocks the power of your jaw so you can be stronger, faster and better in any non-contact sport or activity. You can even personalise your Power Wedges by choosing from four different colour options! Let’s Take a Smiley…and WIN a Sonicare Air Flosser!